STOCKHOLM, SWEDEN, 2017-Dec-11 — /Travel PR News/ — SAS customers were recently invited to influence which destinations our Now or Never campaign should include and a whopping 11.000 people cast their votes over the December 1-3 weekend. We have again listened to our customers and are happy to present their favorite destinations in today’s Now or Never campaign. So where do we want to fly away to? Swedes, Norwegians and Danes alike put the US high on the list. Top of the list of destinations voted by SAS passengers however was Tokyo. “It’s been exciting to see which destination our passengers want in our popular Now or Never campaigns. We have a long history of flying Scandinavians to Tokyo to experience everything the city has to offer, from food, people and an exciting history of skiing close by that people are increasingly discovering,” says Fredrik Henriksson, Director Media Relations SAS Sweden. 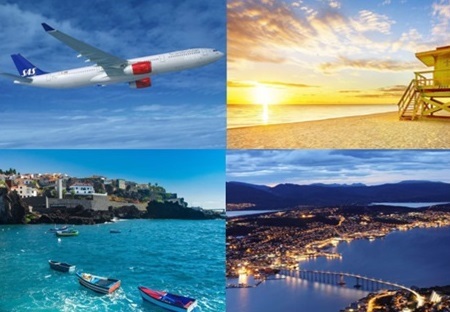 At the same time, old favorites like New York and Miami – which SAS recently started flying to from Stockholm as well – came high on the list along with London, Alicante and Malaga. “Malaga is another favorite that has something for all ages. There are excellent golf courses in the region and skiing in the Sierra Nevada is another reason to go there. Sun and snow only a few hours away appeal in the winter season,” Henriksson says. Under its Now & Never concept, SAS passengers are offered flights to selected destinations at a special campaign price every Thursday from 6pm to midnight (December 7 it is extended to last from 12 noon to midnight). The travel period is from 1 January to 30 April for all destinations. This entry was posted in Airlines, Airports, Flights, Transportation, Travel, Travel Services, Travelers and tagged Fredrik Henriksson, SAS, SAS’s Now or Never campaign, Tokyo tops the list of passengers' favorite destination. Bookmark the permalink.